Trading activity tends to slow down in August but this wasn’t exactly the case last month as some market players reported small gains while others even saw record volumes. Although part of this can be attributed to a rebound over the subdued performance in July, it’s also worth noting how several factors pushed risk sentiment around and spurred more volatility than usual. Derivatives marketplace operator CME Group reported a 29% year-over-year gain in forex contracts per day at 817,000 in August 2017, driven by a 35% jump in euro and yen FX futures and options. FXSpotStream saw a 9.5% monthly gain in FX volumes to $19.2 million in average daily volume (ADV). For institutional forex ECN Hotspot FX, trading volumes were flat at $27.1 billion ADV for the month, still within its usual ADV range for the year. Interestingly enough, August was also off to a slow start like in the past couple of months before activity ticked higher during the latter two weeks. NEX Group PLC saw volumes of $83 billion on the company’s forex matching platform EBS MarketFX, translating to a 27% year-over-year gain. In contrast, forex ECN FastMatch chalked up another decline in forex activity for August of 10% to $16.2 billion. This marks the third consecutive dip in volumes for FastMatch, but it also exhibited a pickup in activity in the second half of the month. As for GTX, the institutional FX arm of retail forex broker Gain Capital Holdings Inc, trading volumes came in at a record $357.3 billion in August 2017 or $15.5 billion ADV. In Australia, retail FX broker IC Markets also achieved record volumes in August at $343 billion or $14.9 billion ADV. Meanwhile, Exness reported its second strongest month ever as August FX volumes reached $274.8 billion, next to its record $313.7 billion in March this year. Over in Japan, the Tokyo Financial Exchange saw a 4% rebound in Click 365 activity in July, down just 4.1% on a year-over-year basis. 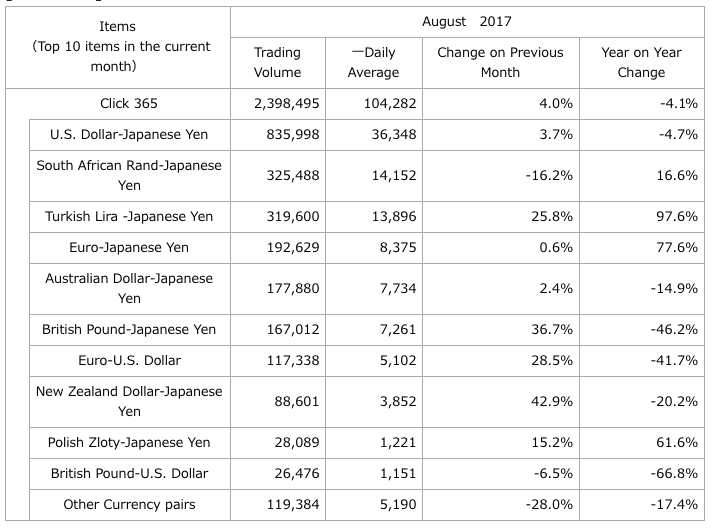 The breakdown of currency pairs traded reveals that the NZD/JPY enjoyed the strongest pickup in volumes for the month, followed by GBP/JPY and EUR/USD. Changes in risk sentiment for the most part of August likely contributed to increased interest in the higher-yielding Kiwi versus the lower-yielding Japanese yen. Central bank expectations also played a big role in pushing currency pairs around in August, particularly for the RBNZ which was expected to be a bit more hawkish and the BOE which reverted to a less upbeat stance. Traders also appeared to steer clear of dollar pairs as external and internal political risks, along with weakening prospects of another Fed hike, kept the U.S. currency in flux and left the Japanese yen and Swiss franc as the safe-havens of choice. Think this kind of behavior and FX industry performance would be observed this month as well?